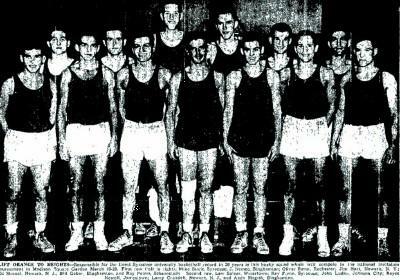 The team had a mix of seasoned players, men who had served in World War II such as Billy Gabor, Andy Mogish and Roy Peters, and young talent such as the tall and angular Royce Newell, Ed Stickel, and Mike Stark. The combination of talent and leadership provided for a great run during the regular season. Stickel and Lew Spicer formed a nice combination of outside shooters, the former with his push shot, the latter with his set shot. Mogish and Newell formed a formidable rebounding tandem up front, and Gabor was the big gun on the court. The team started out in tremendous style, winning its first six games, outscoring the opposition 484-193. The team went through a tough stretch, losing two out of three to Sampson Air Force Base and Michigan State. Mogish and Peters joined the team mid year, following their completion of their military duty; this coincided with the team starting its second impressive winning streak of the season. The team lost Gabor for one game with a leg injury, and he was hampered for a few others towards the end of the season, but they kept winning. The team would conclude its regular season undefeated at home. The team reached the post season for the first time receiving a bid to the NIT Tournament, and were to meet Muhlenburg. There were high expectations, as the team was 23-3, and had played solidly throughout the season. However, the combination of fourteen days off and facing a talented team showed, as the Orangemen were below par against Muhlenburg. The team shooting was poor, especially from the stars Gabor and Newell, and the team accumulated 38 fouls. Ultimately they would lose 47-41. It was however a grand season as the team set a school record for wins, and made post season history.